Sprung a leak in your garbage disposal? Here’s what to look out for. No matter how careful you are and how well you care for your garbage disposal, leaks can still develop. 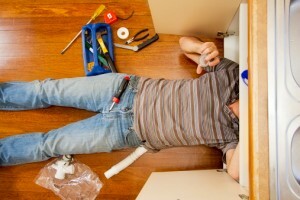 Plumbing is constantly in use and needs maintenance and sometimes needs to be repaired. If you find that your garbage disposal has sprung a leak, here are some tips to figure out how to take care of it. The sink flange: This connects the top of the disposal to the bottom of the sink drain. The dishwasher connection: This is usually a rubber hose that’s connected to the side of the garbage disposal. The drain pipe: This pipe is usually plastic or metal. It drains water and food to the sewer. To try to find the source of the garbage disposal leak, there is a very simple test you can perform. First, you take a towel and completely dry the underside of your sink and garbage disposal. Then, put a plug in the sink drain and fill it with several inches of water. Now, observe the underside of your sink. If there is a steady drip, your leak is coming from the sink flange. If you don’t see any water dripping from the flange, remove the plug from the sink and observe the garbage disposal itself. There is a fairly good chance you will see water dripping from the dishwasher connection, the drain pipe, or the bottom of the actual disposal unit. There are some very good tutorials online for industrious homeowners who want to fix their own garbage disposal leak; however, there are some problems that can be made worse very easily. If you’re really comfortable that it’s an easy fix, go for it! But, know your limits. If your easy fix doesn’t work, just call a plumber. Got plumbing problems? Give Master Plumbing & Mechanical a call at 301-650-9100 and let our experienced plumbers get the job done right. For over 30 years, Master Plumbing & Mechanical has served the Washington, D.C. area, including Montgomery and Prince George’s County. We’ve built our reputation on recommendations from our satisfied customers. We’ve received Angie’s List Super Service Awards for both plumbing and drain cleaning every year consecutively, going back to 2007, as well as the Best Plumber award from Best of Bethesda. Our company is fully licensed, bonded, and insured and we offer friendly, courteous service with fast response times. This entry was posted on Friday, June 9th, 2017 at 3:57 pm. Both comments and pings are currently closed.